It’s officially the first day of fall, and while my outdoor self is crying, my indoor self is excited to get my bake on! There is just something about cool crisp air that makes me want baked goods. I think my body is getting ready for carbernation. Today, one of my absolute favourites, Carrot Muffins! It’s like a cupcake, but it’s healthy… maybe a little bit healthier without the lemon icing, but, meh, cold dark mornings need a little sweet icing goodness. These bad boys are made with 100% whole wheat, 2 woots for whole grains!, Woot, woot! 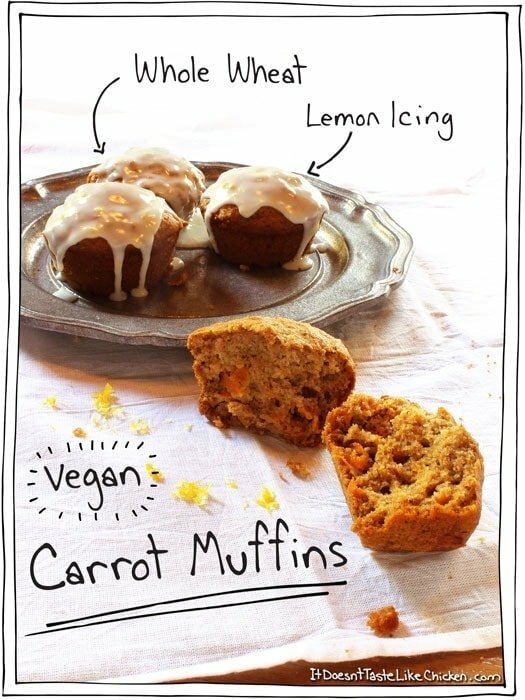 Sweetened with agave or maple syrup (carrot maple muffins anyone? ), I used flax instead of eggs (plant power! ), and they are packed full of carroty goodness. The problem with most whole wheat muffins (at least in my road side muffin and coffee stop experience), is they tend to be all stodgy and dry, but these are far, far away from that world. 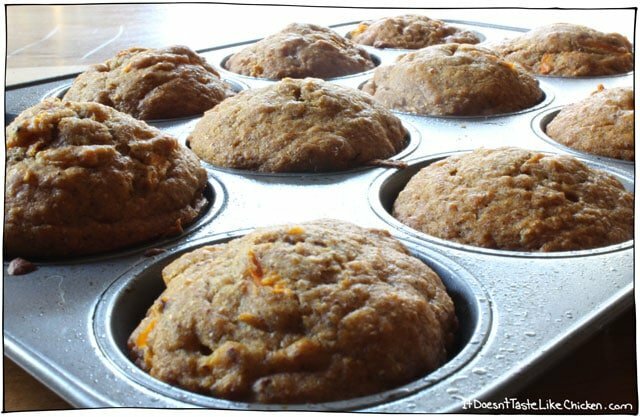 These Carrot muffins are perfectly moist, fluffy, lightly sweet, and just yummy all around. In a small bowl mix together the flax and warm water, and set the bowl aside to thicken. *A note on flax: always buy flax seeds whole and grind them at home in a high speed blender, coffee grinder, or with a mortar and pestal. Store ground flax in the fridge or freezer. If you buy fax that is already ground in the store, it almost always has gone bad. In a large bowl add all the dry ingredients and mix it up. 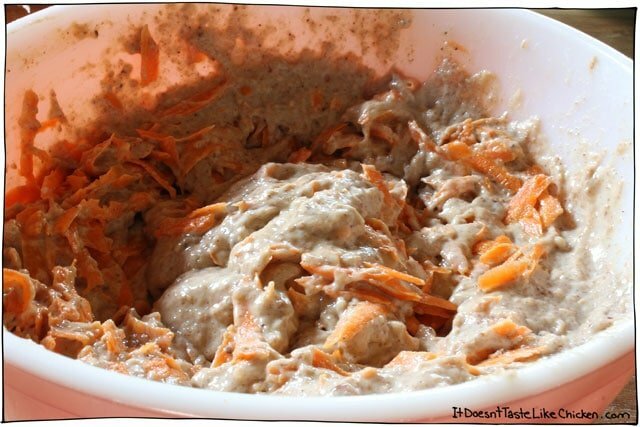 In a medium sized bowl add all the wet ingredients except for carrots, plus your now gooey flax mixture, and and mix it all up. 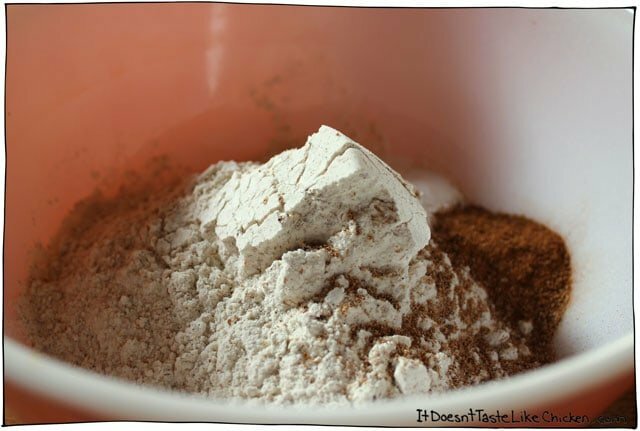 Add the wet ingredients into the dry ingredients and mix until just combined. No over mixing! 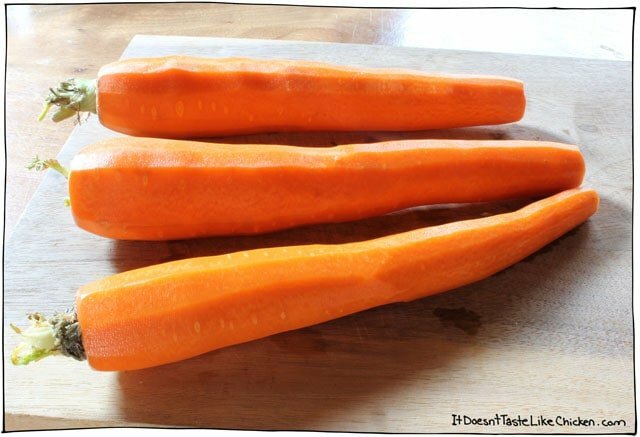 Now add in your grated carrots and lightly fold them in. Lightly grease a muffin tray or use muffin liners. 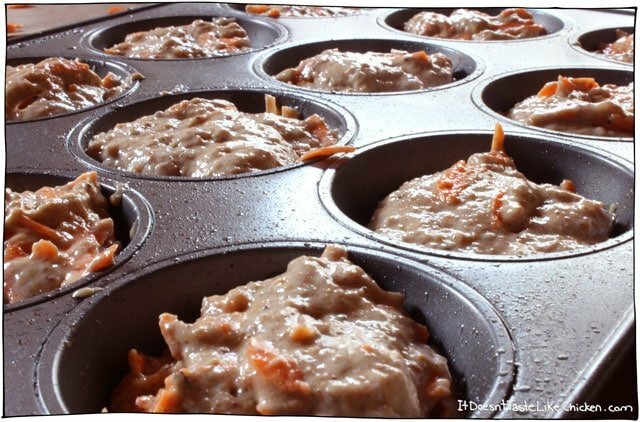 Divide the batter evenly among a muffin tray and pop in the oven for 22-25 minutes. Test by inserting a tooth pick into the middle and seeing if it comes out clean. Oooo aahhhh. Let the muffins cool completely before icing. 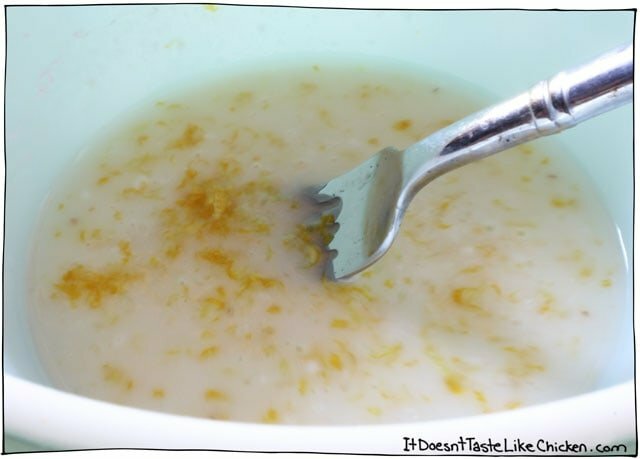 To make the icing, just add the powdered sugar, lemon zest, and one tablespoon of lemon juice to the bowl. If the icing is too thick add another teaspoon of lemon juice at a time to reach a consistency you like. Use a knife or spatula to smear a coat of icing on top. Feature Ingredient: Carrots. 271 Days, 86 Recipes to go! Yummy!!!!! So moist and full of flavor. Do NOT skip the lemon frosting. Going into my rotation for sure . 5 stars!!! Any thoughts on using Chia seeds instead of flax? That would work great! Just grind them up first. Enjoy! Sam, these are so wonderful! 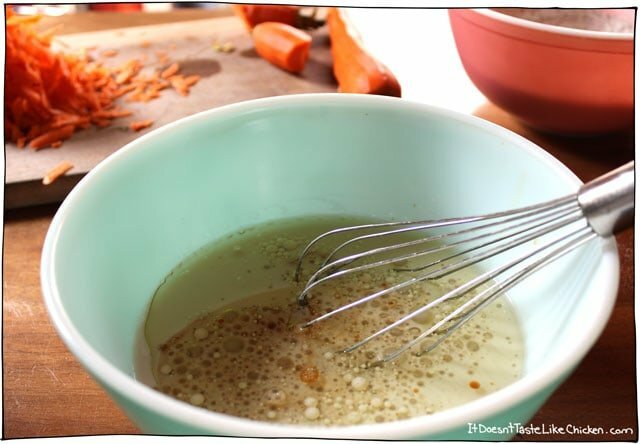 The glaze is so sweet and flavorful that I actually omit the agave from the recipe; instead I use an equal amount of your amazing banana milk recipe! The texture is divine, and it really allows the sweetness of the glaze to shine. This is the second week in a row I have made them for my spouse and I. Thank you so much! That’s wonderful, I’m so happy you enjoyed them so much! 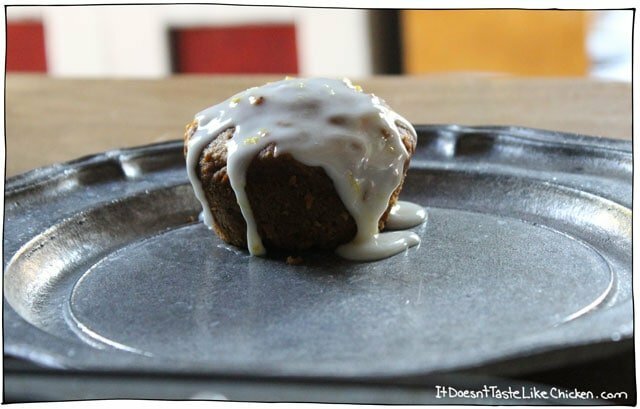 These muffins are very tasty– in fact, next time I plan on omitting the icing as there’s so much flavor in the muffin that the icing really isn’t even necessary. They hold up well in the freezer which is great so I just pop one out at a time and have as a snack. Yay! 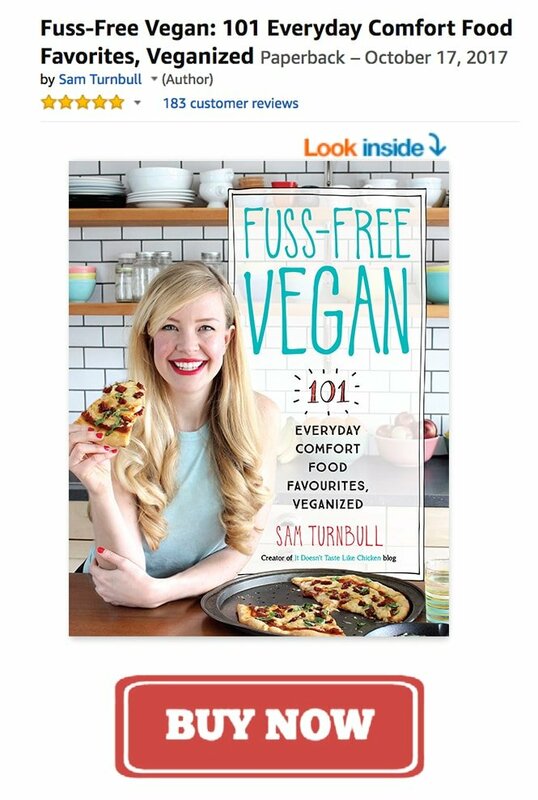 So happy you are loving so many recipes, Rebecca! This is such a great recipe, super light and still moist. Thank you! I am a muffin connoisseur. These are amazing. Full of flavour And moist. Easy to follow recipe. Highly recommend. you had me at carbonation! 🙂 excited to try these! Oh yes PUMPKIN!!!! Don’t think I have forgotten about pumpkin… I have been working on the most perfect pumpkin recipe that isn’t pumpkin pie (because that’s already perfect). Oohhh you reminded me I need to make some pumpkin syrup for my coffee! It will make traffic so much better. What’s your favourite soup or stew? Now that it’s (finally) autumn, I can’t wait to make all the delicious autumn muffins and cakes I’ve been seeing! Like you said, it’s the perfect time for baked goods. 🙂 I’m excited to try these! Yes, it’s finally cool enough that you actually want your oven on! I don’t have air conditioning in my house, so turning on the oven in the summer is like turning on a furnace! So not going to happen!! haha. Ooooh yum! I love veggies in muffins and these look like no exception. Love that you promise they’re not dry (because seriously, whole wheat, you let me down sometimes, buddy) and they look perfect for early fall. Yes, not dry at all!! To be extra sure, make sure not to over bake them. It’s better if they come out a little too moist because they will finish baking and steaming in the pan. I’m about to! Muhahahaha! (Evil muffin laugh).